Please read the feedback from our pupils. I had been putting off driving lessons for ages as I was really nervous about the whole idea of driving, however when I finally did pluck up the courage to start I couldn't have picked a better instructor. Richard was aware of how nervous I was, but I was immediately put at ease by his patience and friendliness. His comments were always positive and even if I had done something wrong, it would always be addressed in an encouraging way so that I always felt I could improve the next time round! I would definitely recommend Richard, especially to all the mega nervous first-timers, and thanks to him I passed first time! Just wanted to give a massive thank you to Richard. I have just passed my test on the first attempt. Couldn't have done it without his great teaching, always very concise and informative with clear instructions. Always very friendly and good humoured. I highly recommend his school! After being a very nervous driver for years Richard gave me the confidence to pass my test. He was very calm and patient with me. I never thought I'd pass so it's a huge credit to him that I did first time! Richards's lessons were to a very high standard and were very informative. He was very patient and helped me to cope with the pressure of other drivers and build my confidence. The relaxed atmosphere made lessons very enjoyable and I have not hesitated in recommending him to friends and family. Although I felt nervous at the outset, Richard immediately put me at my ease. Richard is always calm, patient and helpful and it is entirely thanks to him that I passed first go. Brilliant instructor, who succeeded where so many had failed before. I owe him so much. Richard was a very good teacher. I was extremely nervous to start but was soon put at ease with Richard's plentiful encouragement and large amounts of patience. My lessons were enjoyable and even the more challenging manoeuvres were tackled with enthusiasm. 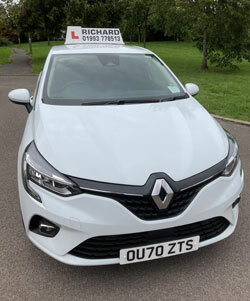 I would strongly recommend Richard to anyone wanting to learn to drive, particularly those less keen to get behind the wheel as Richard is a very understanding instructor. I was approaching my 17th birthday and was desperate to learn to drive. I began having driving lessons with Richard straight after my birthday. He was a great Instructor, was easy to understand and made me feel confident and comfortable. He is really patient and understanding. I passed my driving test first time in January, 2007, which enabled me to fulfil my career as a Sports Coach because I needed a driving license to get to the various school venues. I have since recommended several friends to learn to drive with Richard and they have all gone on to achieve the same success as me. Richard was a very good Instructor; he is very good at building confidence and is very patient when you don't quite get the hang of things first time. Lessons were always enjoyable and Richard made things easy to understand. I would recommend Richard as he helped me greatly in passing my driving test. I learnt to drive with Richard and went on to pass my test first time. I found my lessons both professional and enjoyable. Richard made me feel relaxed, which helped me to gain confidence and pick things up quickly. I would recommend Richard as a Driving Instructor. I know a lot of other people that have learnt to drive with him and they have had the same expert experience as me.